It’s not just personal benefits that a union provides. You too can be part of the movement that gave the world weekends off, the national minimum wage, workplace pensions, the right not to be sacked for being pregnant or sick and many more legal rights. Oh, and ended child labour. These achievements have only been possible because people came together to work collectively, for the benefit of millions. UNISON is a large union, with around 1.3 million members. That’s a lot of people to have on your side when there’s trouble. But it could be more. Across the economy, trade union membership is quite low – and most workplaces will include workers who aren’t members of any union. But the more union members there are at work – the higher our ‘union density’ in the jargon – the stronger our voice and more able we are to protect one another. And what’s true in individual workplaces and councils, NHS trusts, other public bodies and firms, is also true of society as a whole. The first and most obvious way to grow the movement is to ask people to join. Most people who aren’t in a union give one simple reason: “Because no-one asked.” So let’s ask them. It’s easier than you think. There’s a saying in union circles that “like recruits like” – in other words, potential members are more likely to be recruited by colleagues they know and trust. So talk with your colleagues about the union: be honest and be prepared to listen to their concerns and issues. Don’t be shy – spread the word and help UNISON to grow stronger. UNISON is a member-led union; democracy is central to our structure and our achievements have been reached as a representative, democratic union where everyone has an equal voice. 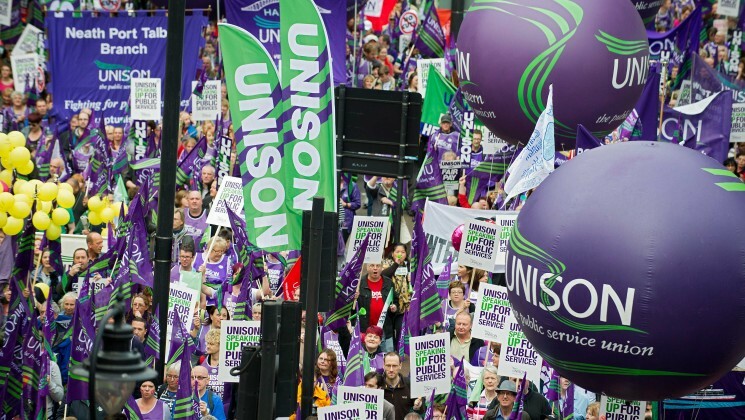 It is members who determine the issues and policies that UNISON takes forward through our conferences. You can take part in discussions when it comes to drawing up motions for national, service group or other conferences. UNISON’s conference brings together over 2,000 members from all the regions and service groups for four days every summer. It is where the decisions are made about the issues that the union will be prioritising over the coming year. Every UNISON branch elects delegates to attend and vote on behalf of their local branch members – and we are careful to ensure that women, Black, LGBT, disabled, retired and young members are represented fairly. Make sure your branch sends delegates to national delegate conference, service group conferences, other conferences and your regional council – and play your part in electing them. You could even consider standing as a delegate yourself. Service groups bring together members across the country doing similar jobs or working together for the same employer, everyone working in local government is in one service group, for example. Each service group holds a conference each year, lasting between one and three days, where members come together to debate issues that are relevant to them. Delegates are elected by their branches to attend service group conferences. To find out more speak to your branch. UNISON is Europe’s largest public service union. Our members work in the public services and for private contractors providing public services. We believe the UK public deserves high quality public services, and because we work in them, we know when we need to campaign to save and improve them. If you believe the UK deserves quality public services, please support us in our campaigning. Sometimes we’ll need you to support us on public marches, sometimes by emailing your MP. Why not communicate your story to fellow union members as well? Consider writing something in your local branch newsletter or on its website. Write a letter to our members’ magazine – U magazine is mailed to every member four times a year. Use social media to follow UNISON and let us know what you’re thinking. Many UNISON branches and regions are on social media, too. UNISON members are united with around five million other trade unionists across the UK, through the Trades Union Congress (TUC). The TUC campaigns for a fair deal at work and for social justice at home and abroad, UNISON is a member because the more people that unite to achieve these aims, the more likely we are to achieve them. Find out about working for UNISON and see our latest vacancies.